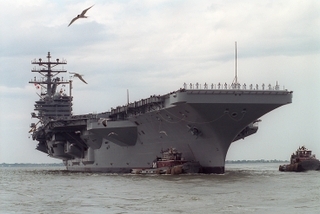 NEWPORT NEWS, Va., May 29, 2003 (PRIMEZONE) -- Northrop Grumman Corporation (NYSE:NOC) announced today that the nation's newest and most advanced nuclear-powered aircraft carrier, Ronald Reagan (CVN 76), has successfully completed acceptance sea trials. The Reagan is the ninth Nimitz-class carrier built by Northrop Grumman's Newport News sector. The acceptance trials are conducted with representatives of the U.S. Navy Board of Inspection and Survey for testing and evaluation of the ship's systems and performance. Upon completion of sea trials, Reagan returned to Norfolk Naval Station in Norfolk, Va., where it will be commissioned July 12, 2003. "This is a proud moment for us," said Bob Gunter, Northrop Grumman Newport News senior vice president, Aircraft Carrier Program. "It's the culmination of years of hard work by thousands of shipbuilders. Soon we'll be delivering the most technologically advanced ship in the world to the Navy. And once she becomes part of our nation's defense, we'll follow her progress with great interest and take pride in her contributions to America." Named after America's 40th president, Reagan is ninth Nimitz-class aircraft carrier and the first carrier named for a living president. The keel of Reagan was laid Feb. 12, 1998, and the ship was christened at Newport News March 4, 2001. The ship will be delivered to the Navy in June 2003. The Reagan is commanded by Capt. J. W. "Bill" Goodwin and currently has about 2,600 crew members onboard. It towers 20 stories above the waterline, and at 1,092 feet long, is nearly as long as the Empire State Building is tall. The ship displaces approximately 95,000 tons of water when afloat. Reagan has a 4.5-acre flight deck, more than seven million feet of cable, and when operational will house approximately 6,000 personnel and 80 aircraft onboard. Northrop Grumman Newport News, headquartered in Newport News, Va., is the nation's sole designer, builder and refueler of nuclear-powered aircraft carriers and one of only two companies capable of designing and building nuclear powered submarines. Newport News also provides after-market services for a wide array of naval and commercial vessels. The Newport News sector employs about 18,000 people.